It’s not very often that one can walk away from purchasing a car saying “that was the best experience ever!” or “Wow, what a great deal!” However, I happened to be an exception to the rule when I chose to pick up my new car through the BMW European Delivery program in April 2007. One does not often lump “good deal” and “BMW” into the same sentence unless separated by “NOT”, but if you are ever in the market for some fine German engineering, please consider taking European Delivery. Not many car companies offer such a wonderful program, where the sticker price for picking it up in Europe is less than what you pay in the US AND the cost difference covers most, if not all of, the price of your trip! We were very fortunate to be able to fly over to Munich via US Airways in business class. Originally, we thought the flight would be a code share, where we flew on Lufthansa and had an authentic German crew. However, I was disappointed to find out that we were flying US Air and we had an authentic South Philadelphia crew (side note if you grew up or ever lived near Philadelphia, like I did, you know all about that.) Overall, I can’t complain because none of the flights were delayed. Upon arrival in Munich, we found our way to the private car transfer we had arranged through Bavaria-Shuttle. The transfer was a bit expensive, but we had a very nice English speaking driver and we were transported in a very well appointed Mercedes, as if we were celebrities! We arrived at the BMW factory and went through the 2-3 hour process of picking up the car, signing all of the required paperwork, and getting the introduction to the features in the car. At the time, the BMW museum was closed for renovations, but is has now reopened as BMW Welt and is supposed to be a must-see, fantastic experience. I have a feeling I’ll be heading there soon! Once we left the factory and found our way to the Autobahn to officially break in the car at a 130 mph, we were off to our first destination. Since this was a driving trip that included several destinations, I will list each destination and break it down into categories: City, Hotel, Food, and Activities. Please keep in mind that we only had 1 day at most destinations, so I can guarantee that I missed a lot of the wonderful activities and sights in my reviews. Mittenwald is a small village located in the Bavarian Alps, just north of the Germany-Austria border. It is best known for frescoed building exteriors and its world renowned violin makers, but I just wanted to spend time in an authentic Bavarian village (side note off of the A-95, on the way to Mittenwald from Munich, we stopped in the small village of Eschenlohe, which was untouched by tourism and very quaint!). Hotel: We stayed 1 night in Post-Hotel, which is located toward the center of town, right along the main cobblestone shopping area. The hotel is very modest and inexpensive, but the rooms were very clean and well maintained. The hotel also offered a breakfast buffet in the room price, but it was definitely traditional German foods, so I only had some bread. For those that don’t like the smell of cigarettes, the hotel did allow smoking in the downstairs bar area, so you noticed the odor as soon as you walked in. It was not noticeable in the rooms, though. Food: With only one night in Mittenwald and having stuffed ourselves with pretzels, we chose to eat at a local Italian restaurant just outside of our hotel. The restaurant, Osteria, was fairly large with an extensive menu. The staff did not speak English very well, but the orders came out as requested. In fact, this is probably the only restaurant we visited where the language barrier was an issue. The meal was decently priced and we had no complaints. Activities: With such limited time in Mittenwald, all we could do was walk along the cobblestone path through the center of town and enjoy the painted homes and peek in violin shops and an old church. The scenery is amazing and it would have been nice to taken a cable car ride to get a bird’s eye view of the Alps, but it was a bit too chilly for liking. After our short stay in Mittenwald, we drove back through Garmisch, back onto the Autobahn, briefly into Austria, and down into Switzerland (It should be noted that when you get to the Austrian border, you must stop to buy toll stickers for both Austria and Switzerland.) The highways in the northern part of Switzerland are open and mostly free of traffic, but there is a speed limit. So, after about three hours and a bathroom break/$100USD gas-up in Lindau (cleanest gas station bathroom EVER! ), we arrived in Zurich. 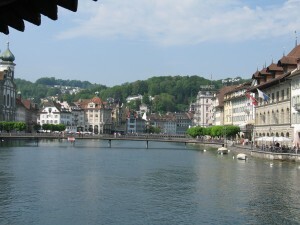 Hotel: Zurich is known for high end business travelers, banks, and wealth. So, I wanted to to be one of the wealthy business travelers, if even just for 1 night. So, to do that, a stay at the famous Baur Au Lac is a must. The hotel overlooks Lake Zurich and, while the entrance is a little hard to find, once you see it, you’ll know you are in the right place because of the Rolls Royce Phantom parked in the courtyard. It’s yours to use for a transfer to the airport upon request! We stayed in a double room and we thought it was quite large and had a gorgeous marble bathroom. Everything about it was stately, including the price. It was also an excellent hotel to just enjoy watching people mill about. Food: You can’t be in Switzerland without having some fondue. So, since this was our first stop in Switzlerland EVER and I had done a bit of research beforehand, we had dinner at Adler’s Swiss Chuci, a traditional Swiss restaurant in Old Town (which also has an adjoining hotel.) I wouldn’t be surprised if we ended up staying here if we return to Zurich! We also had lunch the following day at Terrasse, which is a swank restaurant at Baur Au Lac. Terrasse is pricey, but that’s what happens when you dine with Zurich’s elite! Activities: We crammed a lot of things into the little time we had in Zurich. We slept in WAY too late since we had a little bit of a jet lag issue, so we had to act quickly to see what we wanted. We spent the majority of our time at the Swiss National Museum, but we also walked around the business district, stared in delight at the chocolates at Sprungli, and browsed a market at the train station. Following our brief stop in Zurich, we made our way down through Switzerland and it’s many mountain tunnels to the Lake Como region in Northern Italy. It was quite a long drive- around 6 to 7 hours, because it’s not all straight highway (and, of course, we had to stop and take pictures!) For our Northern Italian portion of the stay, we decided that since the drive was so long, we’d stay for two nights. I’m very glad we did, as I could not have envisioned getting back in the car less than 24 hours later. Hotel: For our Italian portion of the getaway, we chose to stay at Villa d’Este in Cernobbio. Villa d’Este is a former royal palace and the grounds absolutely reflect the royal touch. I have never stayed at such a well manicured resort before and I even envision holding a wedding there! The resort as a whole, from the staff to the rooms, was just amazing. With that, I have to admit that Villa d’Este’s immaculate grounds and top notch service come with a steep price tag. They certainly do take care of you for what you pay, and we were even upgraded from a deluxe double to a deluxe corner room on the top floor of the Queen’s Pavillion. We had sweeping views of the lake which made for a very romantic and dramatic setting. Our room was decorated in light red/pink and gold hues with period decor. Villa d’Este is a true example of European royal flair. Food: Villa d’Este has a few dining options on-property, but the jacket and tie-only Veranda was far too fancy for my taste! I just could not fathom paying over 50 Euros for my meal alone and being too picky to eat most of it. So, our first night, we made reservations at The Grill, which is the informal restaurant. The food was very good, yet not what one typically associates with Italy. 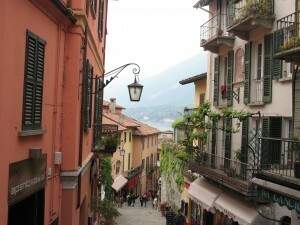 The regional cuisine in Lake Como is lighter and based more on meats than pasta. I, however, enjoyed some homemade pasta and breads. The following evening, we opted for something more along the lines of what a typical American would have- pizza! We dined at Ristorante Giardino. The pizza was good, but not as fantastic as the true Italian pizza is made out to be. I think it was due to the region. For lunch on our “touristy day”, we dined in Bellagio on gelato, panna cotta and tiramisu. One important thing to note about Italy in particular are the late dining times. Dinner service at Villa d’Este did not begin until 7pm. While this is wildly common throughout Europe, a lot of Americans- myself included- are not accustomed to eating that late. Be sure to snack in between time! Activities: Even though we stayed at Villa d’Este the longest of any of the hotels, we didn’t do veyr much in terms of activities. Just a lot of walking! We drove to the ferry that goes over to Bellagio (as mentioned above) and also wandered around Cernobbio. It was interesting just to enjoy the gorgeous scenery surrounding the lake. After a whirlwhind 2 nights in Italy, we hit the road to head back to Switzerland for our stay in Interlaken. We were not looking forward to the long drive back, but we were looking forward to not having to drive in Italy anymore! It was truly the craziest driving I’ve ever done. As with our drive down to Italy, we enjoyed stopping along the way to take pictures. Hotel: Going along with the trip’s theme, we stayed at the most luxurious property in Interlaken: The Victoria-Jungfrau. It sits in the middle of town and the large structure is clearly stately and majestic. Upon checking in, we noticed that the decor and interior wasn’t an “old world stately royal” as Villa d’Este but rather royal with a modern twist. It’s hard to explain, but the hotel is a mix of ornate old world elegance (restaurant, bar, lobby) and simplistic modern elegance (the rooms). The staff went out of their way to make sure we were comfortable and knew our way around the property. The one thing at the hotel that we wish we had seen and gotten to experience is the spa. The spa is highly rated and is actually two spas in one- ESPA, which utilizes Western techniques, and SENSAI, which focuses on Japanese techniques. Sounds relaxing, huh? Food: The Jungfrau has several restaurants- one focusing on local cuisine, another higher end restaurant focusing on international cuisine, and yet another with a Mediterranean cuisine. We only dined at the hotel for breakfast, which along with the other hotels, was exceptional. For dinner during our one night there, we chose to eat at Laterne, which serves fondue and swiss cuisine. It was authentic and delicious! Activities: Our activity in Interlaken was a big one and probably the best one of the trip! We had been excited to head to the “Top of Europe”, but the weather was not good and the top of Jungfrau Mountain was closed to visitors. 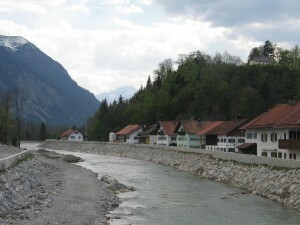 However, we were still able to take a cog train up the mountains to visit some of the cute Swiss villages. We spent the majority of our time in Grindelwald, which is a small village along the train route to Wengen. Grindelwald is scenic and has gorgeous views of the valleys below the massive Eiger and Wetterhorn peaks. It’s the perfect village to just wander around and enjoy the views. We wish we had more time in Interlaken, as it’s a great jumping off point to the mountain villages and the gateway to a lot of outdoor activities. However, we had only planned for one night and we were then off to our last major stop of the trip: Lucerne. The drive between Interlaken and Lucerne was short in comparison to the other drives and allowed some time upon arrival into Lucerne to wander around the hotel. I also stayed at the Palace Luzern in Lucerne. In the meantime, enjoy the pictures below as a tease! Please connect with me if you have any additional questions in the meantime!